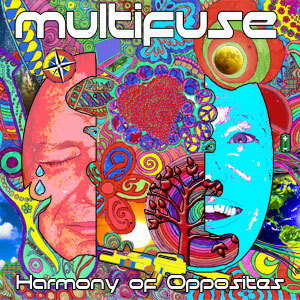 ‘Harmony Of Opposites’ (HOO) is the second album composed by Peter Fallowell for his project, Multifuse, and it sees him returning to his Rock roots with electric and acoustic guitars combined with contemporary keyboards to produce a lush background for the 10 tracks that constitute the album. “The songs are about things that make me feel good or not so good” (Peter) and the first single ‘Imaginary Ways’ explores the pitfalls and pleasures available to everyone who uses the internet. Various emotions are explored in all the songs such as those felt within families, holding on to the warm feelings of summer, not putting off to tomorrow what we can do today……..and the lyrics are written in a way that the stories can relate to listeners’ own personal lives. Multifuse was created to showcase Peter’s music on the Crooked Cat Music label and the first album ‘Journey To The Nesting Place’ was an exploration of dreams, nightmares and memories, and was keyboard based. Although Peter is a multi-instrumentalist/vocalist, there are important contributions from other musicians in the recording of ‘HOO’. The bass parts were provided by Fabio Fecchio, an Italian bassist currently living in Paris, with lead and backing vocals by Richard Robinson and Cherie Emmitt from the UK. We are keen to express that the music of Multifuse explores many emotions we all have…………but sometimes keep inside.